Platforms including 4chan, 8chan, and LiveLeak hosted footage of the New Zealand mosque attacks that killed 50 people last week. In response, a number of internet service providers in Australia temporarily blocked sites that hosted the videos. “We believe it’s the right thing to do, out of respect to the victims of this atrocity and their loved ones, to help stop the further sharing of this disturbing video,” Vodafone Australia said. Facebook and Google have also been scrambling to halt the spread of the video over the past few days. Internet service providers in Australia blocked platforms including 4chan, 8chan, and LiveLeak after the sites were found hosting footage of the New Zealand mosque shootings that killed 50 people last week. Vodafone Australia, TPG, Telstra, and Optus blocked various combinations of sites including 4chan, 8chan, LiveLeak, Voat, Zero Hedge, and KiwiFarms in the wake of the attacks, Kotaku reported Australian internet users as saying. The gunman who shot up the Al Noor and Linwood mosques in Christchurch last Friday broadcast live footage of his attack to Facebook. The video was later reposted on multiple platforms, including Facebook and YouTube. Vodafone Australia said in a statement that it had “placed temporary blocks on dozens of sites” found to be hosting footage of the shootings. A spokeswoman for the company confirmed to Business Insider that it will lift blocks on platforms when they remove the footage, and said a number of sites still actively hosting the videos are still blocked. She declined to name the other blocked sites. 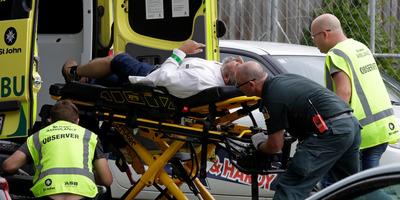 (Mark Baker/AP)Ambulance staff take a man from outside a mosque in central Christchurch after the attack on Friday. “We have taken this action because we believe it’s the right thing to do, out of respect to the victims of this atrocity and their loved ones, to help stop the further sharing of this disturbing video,” Vodafone Australia said in a statement. The Australian Associated Press reported that 4chan, 8chan, Voat, Zero Hedge, and Liveleak all failed to load on Vodafone Australia, Telstra, and Optus networks on Wednesday. It’s not clear which of those sites remain blocked or have since been unblocked. Business Insider has contacted TPG, Telstra, and Optus for comment. At least three internet providers in New Zealand – Spark NZ, Vodafone NZ, and Vocus NZ – also temporarily blocked platforms distributing footage of the attack last weekend, tech news site Bleeping Computer reported. US tech firms like Facebook and Google, which owns YouTube, scrambled to remove videos of the attack on their platforms last week. Facebook said it deleted 1.5 million videos of the attack from its platform within 24 hours, 1.2 million of which were automatically blocked before they could be uploaded. The day before the attacks a man uploaded a racist manifesto on 8chan explaining why he would shortly be killing Islamic “invaders.” The post was linked to the Facebook page of the suspected shooter, 28-year-old Australian Brenton Tarrant.